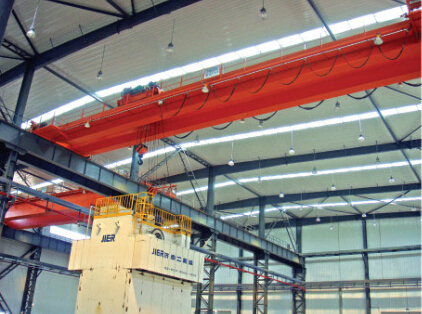 QD overhead crane，based on GB/T14405-2011 standard，is almost applicable to all kinds of environments such as processing workshops，mines ,warehouses railway and port. There is a wide range of span to choose and special span can be designed in accordance with customers’demand. 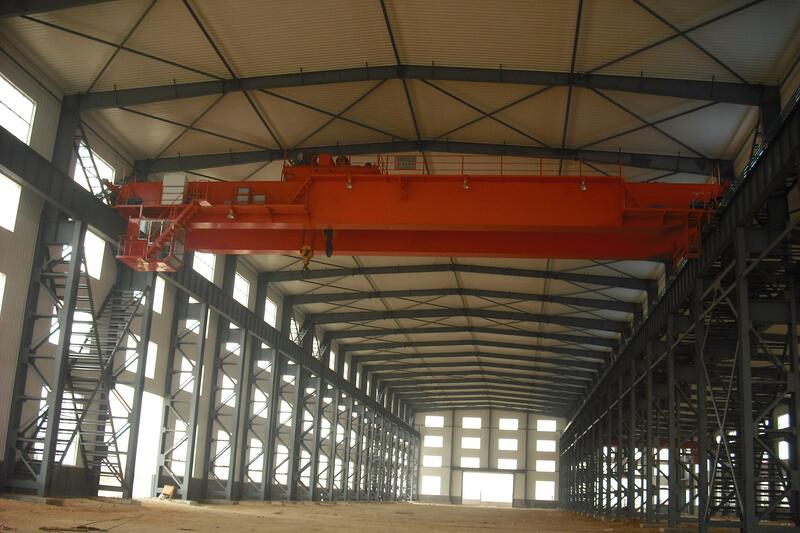 (1)The crane is mainly composed of bridge，trolley，travelling mechanism and electronic system. (2)Its bridge is composed of two main box-girders and two end car riages，which are connected with each other，as well as two platforms along with main girders. (3)All the transmission adopts middle-hardened reducers,Reducers, motors and brakes are connected with each other by means of couplings. (4)Travelling mechanism adopts respective drive. Reducers，motors and brakes are mounted on platforms. (5)There are two kind of manipulation，open or closed cab’s control. a)All through old QD crane has many advantages such as high classification group，low rate of failure and high stability and reliability，the above-mentioned drawbacks make it become more and more unfavou rable in modern industry. 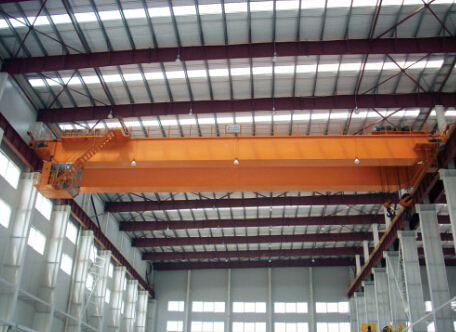 Combining its main advantages and advanced technology developed in recent years, new QD overhead crane is designed. 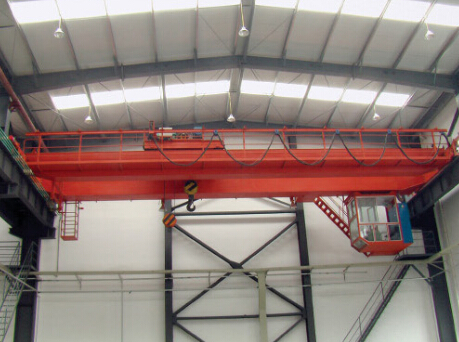 Compared with old QD crane，it has compact structure,light weight, low noise ,flexible assembly，reliable control system，etc. 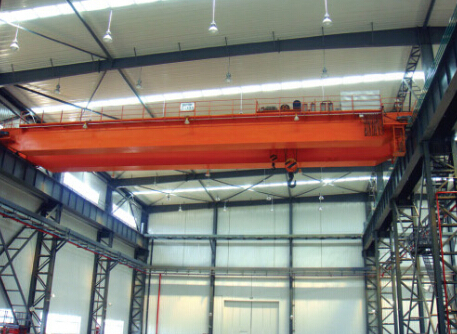 b)The crane is mainly composed of four-beam bridge, travelling mechanism trolley and electrical system. c)Hardened reducers are widely mounted on Main hoisting mechanism，travelling mechanism and trolley because of their excellent features of small dimension，light weight，high strength, high accuracy and reliability of transmission. d)Both travelling mechanism and traversing mechanism adopt "three in one" closed drive. The former adopts respective drive and the latter adopts centralized or respective drive. e)Both travelling mechanism and traversing mechanism adopt variable frequency for speed adjustment. Hoisting mechanism adopts resistors or variable frequency for speed adjustment. f)There are three kinds of manipulation: cab’s control,ground wired button control and remote control.